What is the most-parodied Wacky? That's a total of eight-more than I've ever seen for any product! Am I right, or can anyone else find a product that's been done more times than this one? Re: Kit Kat: the most-parodied Wacky? I gotta believe Dunkin Donuts is right up there with it, especially if you include the bag of ground coffee (Bumpkin Dimwits) and the styrofoam cup of coffee (Dumpin’ Donuts). The donuts themselves have to have been spoofed at least 5 or 6 times. I’d say a handful of others probably come close, especially from repeat parodies in the ANS era. I’ve always wanted to take the dozen or so products that have been repeat-spoofed the most times and place all the parodies in a line for each product, to see how they compare side-by-side. The Dunkin Donuts parodies have always been detailed and well-rendered, so that would be a visual treat for sure. Re: What is the most-parodied Wacky? So far, Dunkin' Donuts is the winner with nine! Are there any challengers able to beat this? It looks like we have a new winner: Cap'n Crunch with ten! Has anyone else got anything else to suggest? Not official, but i did Fester Flakes for Halloween!! To a lesser extent, say 4 to 5 separate parodies each, Pepsi, Rice Krispies and Froot Loops come to mind. What about Lucky Charms? I feel like we did that one a lot. How about Snickers: Sticker, Sneakers, Snakers, Stitchers, Snarkers, Snitchers, Slithers. Snicker and Flippers (From Quacky Packages). 9 total. Also Ring Pop: Bling Pup, Ring Pope, Sting Pop, Thing Pop, Power Ring Pop and Wing Pop (From Quacky Packages). 6 total. And don't forget "Wacky Packages". I think there's been a few of those, too! Neil has a point, Mike. There has to be a ton of Wacky Package parodies beginning with "Wormy Packages" and ending, I believe, with "Fracky Packages." As for Snicker, can you tell me what series and year that was, 7-Pup? I looked all through the Spreadsheet, but couldn't find it. Snicker is from Trumpocracy : The First 100 Days (2017). Thanks! I did not even know that it was there! *A Turd (Philly Non-Sports Card Show promo card #99 (2017)). I think that this section should be changed to "What is the most-parodied Wacky?". Pat, can this be done? I think if you edit the Subject line in your first post, it’ll be reflected in the name of the thread as well. Thanks, it worked! Now if it can just be changed in the posts that aren't mine, that would be even better! 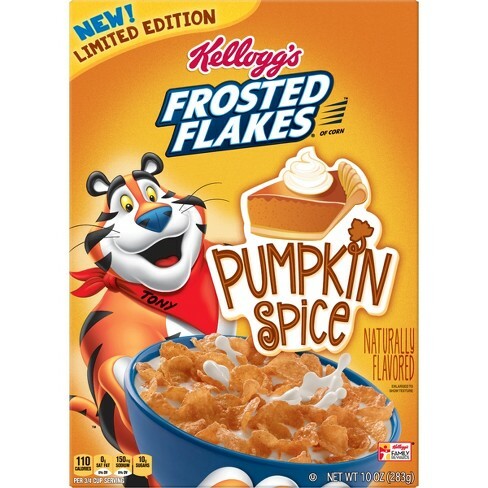 Did Kellogg's actually release a Frosted Flakes Pumpkin Spice this Halloween? I think that I may have seen it, but I'm not sure. And if they did, can someone post a picture of the box? I missed out on Trader Joe's Pumpkin Joe's O's cereal this year Very bummed - I usually buy several boxes to last me through the year, but they sold out really fast this time. Thanks, Patrick! For a minute there, I thought that I was imagining things! Was it only at Target, though? I thought that I saw it at Publix. And Scheres, what is your non-Topps Wacky of this? Is it a postcard, a sketch card, or what? I ask this because I'm going to add it to the Frosted Flakes list. I take it that it was done this year, too. Note: This is the new packaging in which the animals are free to roam on a drunken, celebratory binge. I did the Fester Flakes as a Halloween 2018 limited card. Only 50 made, barroom animals is in my latest card set. there's less than 20 left of those left..